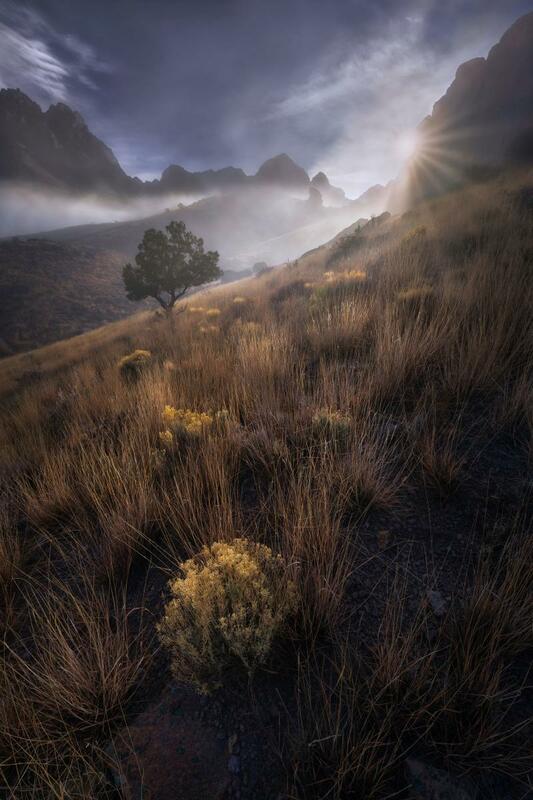 Above: Organ Mountain Morning Mist by Wayne Suggs. Photography by Wayne Suggs. On a typical afternoon, I am with my camera gear, driving along a rocky two-track road in the shadow of the Organ Mountains, in southern New Mexico. My Australian cattle dog, Giggsy, paces in the back of the SUV. He knows we’re almost there. I’ve known this road since I was 12 years old. Back then, I was perched on one wheel well, my brother on the other, in the back of my dad’s ’69 Chevy pickup. My little sister sat in the front between my mom and dad. In my mom’s lap—always—sat her trusty Nikon F1. Back then I couldn’t care less about the photographic splendor of the Organ Mountains. They were just my playground, the place where I raced my brother above the waterfall to where our swimming hole awaited below a big cottonwood. It wasn’t until I was a little older that I began to notice my mom’s photography books all around our home. 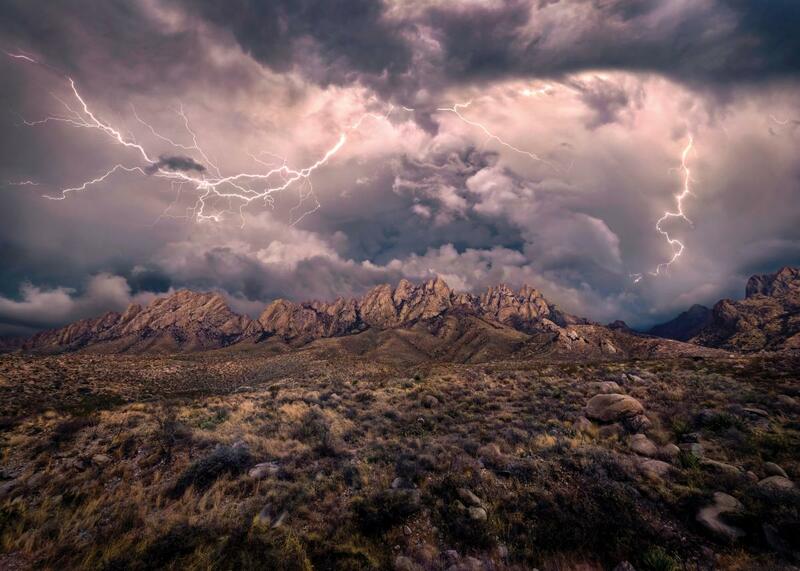 David Muench (see “A Mountain of Love,” p. 68) wrote one of those books, and in that book were shots of the Organ Mountains. A world-famous photographer was actually taking photographs of my mountains? Later, as I learned about f-stops, shutter speed, and the ephemeral magic of light, I also realized that no matter where I go in the world to take an image, I’m incredibly fortunate to have these photogenic mountains in my backyard. Photography has always been a big part of my life. Even though I pursued other careers, the example that my parents set stayed with me, and, whenever I could, I roamed open places and petroglyph-rich cliffs with a lens and a growing awareness of how light can change a landscape—even moonlight and especially a galaxy of stars. A friend encouraged me to enter New Mexico Magazine’s 2015 Photography Contest. I did, and, to my surprise, I won. 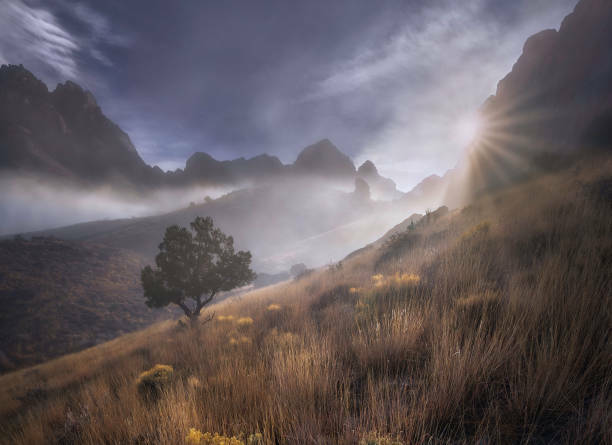 The prize was admission to the Santa Fe Photographic Workshops, and I chose one led by Marc Muench, son of that famous photographer I had once read about in my parents’ living room. That award and the workshop turned into a journey I never could have imagined. I soaked up everything I could—so much that, now, I actually work for Marc through Muench Workshops, helping other photographers sharpen their skills. Warren Malkerson has granted me space for a large permanent showing at his Tularosa Basin Gallery of Photography, in Carrizozo. Big Picture Gallery, in Las Cruces, also carries my work, and it’s been published in Reflector, an astronomy magazine. I won an Oliver Award from the American Rock Art Research Association for my images of petroglyphs at night. Although much has changed in my career, I still return to the Organs. These days, the two-track road I take to reach them ends at a gate. I hike the rest of the way in with camera gear on my back (a selection of Nikon bodies, various lenses, Really Right Stuff tripods and Breakthrough Photography filters), and my dog by my side. Almost always, I have a composition in mind. The hours pass like minutes. By the time I’m hiking out, the sky gleams with stars. My headlamp lights the way. A pack of coyotes cries with joy as they converge after the day’s hunt. On the drive home, I see the eyes of a half dozen mule deer glow in my headlights. Finally back on pavement, I&apos;m still filled with warmth from the incredible afternoon’s light. The setting sun lit the jagged peaks on fire. I got my shot. I am content—just like the 12-year-old boy of many years ago. These mountains are still my playground. When a late-winter rainstorm cleared, fog and mist rose in the craggy depths of the Organs. I woke early and hiked up to this spot, set my tripod and camera in place, and waited for the sun to kiss the edge of the mountain peak. 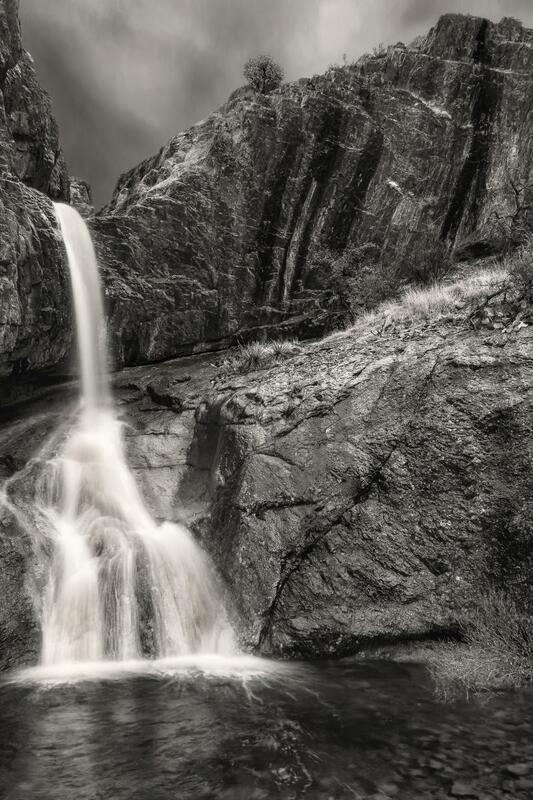 After a good rain or during melting snow, the Organ Mountains have beautiful waterfalls. I waited in the rain for over three hours to take this image. When the rain finally stopped, I removed the cover from my camera and, with a shutter speed of almost a second to slow the water down, took the image. I rarely choose black-and-white, but this time it fit the mood very well. In September 2015, there was going to be a lunar eclipse referred to as the “blood moon.” With my good friend and fellow photographer Rory Hayostek, I searched tirelessly for over a month, trying to find a location that would do the rising moon justice. Finally, a week before the big event, using apps that told us exactly where the moon would rise, we found this location in the Organs. Everything came together perfectly that evening. 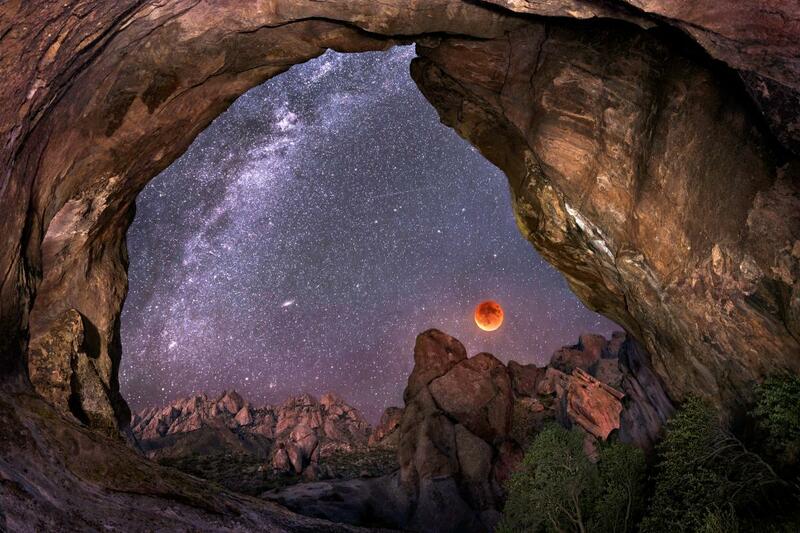 The Milky Way lined up with the wall of the cave. The Andromeda galaxy was in the photograph, along with a meteor. There was zero wind and no clouds. On the hike back down to our vehicle, I remember Rory and me high-fiving and congratulating ourselves for all the homework and the miles we hiked. It was so worth it. 4mm, ISO 100, f/13, 1/10 second Heavy July and August monsoons make the Organs come to life. 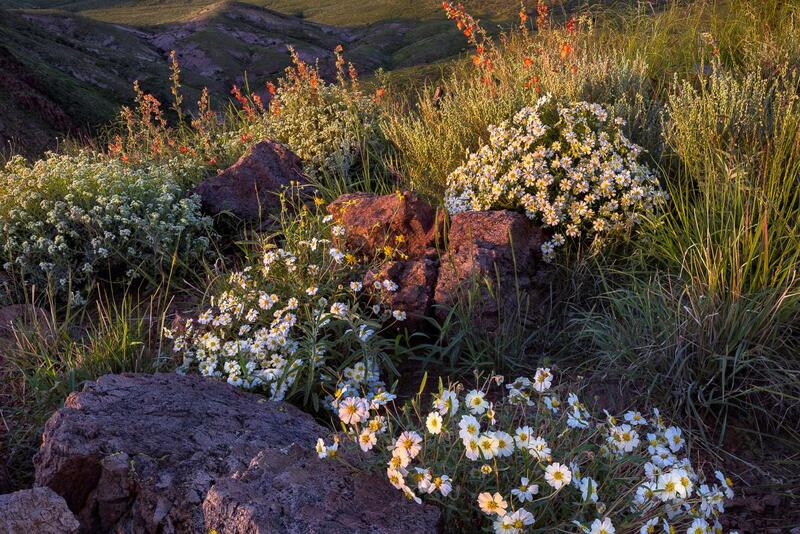 Blackfoot daisies and globe mallows dominate the foreground and lead your eye to the jagged peaks. Photographer Wayne Suggs lives in Las Cruces. Find his classes at muenchworkshops.com.